What do Late Modern English grammars, cookbooks and letter-writing manuals have in common? They all show a remarkable increase in popularity during the 2nd half of the 18th century. I’ve described this for grammar books in Tieken-Boon van Ostade (2008), and this is particularly evident for the publication history of Robert Lowth’s grammar of 1762, but we see a similar increase in the popularity of Hannah Glasse‘s The Art of Cookery Made Plain and Easy (London 1747), which was reprinted at least 33 times within fifty years of its original publication (Tieken-Boon van Ostade 2009:139). The reason for the popularity of these two books is similar: the effects of the Industrial Revolutions were already beginning to make themselves felt. People with more money wanted explicit guidance of correct language use and on how to entertain in style. But what about letter-writing manuals? These, according to Fens-de Zeeuw (2008), became very popular, too: of The Compleat Letter-Writer, Fens-de Zeeuw notes, “at least nineteen editions [were published] until 1800”, after it first came out in 1756. The need for guidance was the same: the 18th century has become known as the great age of letter-writing, and in particular women needed instructions on how to write letters, but so did the lower classes. It is particularly for their further education that these letter-writing manuals contained brief grammars and presented spelling and punctuation rules, alongside of course providing practical rules on how to address members from the different sections in society. There are differences as well: while Hannah Glasse’s cookery book was published by subscription, Lowth’s grammar was not, nor were the letter writing manuals. At least, the ones in ECCO do not contain lists with subscribers, unlike the copies of Hannah Glasse’s book. These lists, by the way, offer is a fascinating insight into who her readers were: mostly women, and mostly from the (lower?) middle classes. Fens-de Zeeuw, Lyda (2008). ‘The Letter-Writing Manual in the Eighteenth and Nineteenth Centuries: From Polite to Practical’, in Marina Dossena and Ingrid Tieken-Boon van Ostade (eds. ), Studies in Late Modern English Correspondence: Methodology and Data, Bern: Peter Lang. 163-92. Tieken-Boon van Ostade, Ingrid (2008). ‘The 1760s: Grammars, Grammarians and the Booksellers’, in Grammars, Grammarians and Grammar Writing in Eighteenth-Century England, Berlin/New York: Mouton de Gruyter, 101–124. Tieken-Boon van Ostade, Ingrid (2009). An Introduction to Late Modern English. Edinburgh: Edinburgh University Press. After watching BBC’s: Servants; A life below stairs (29 September 2012), I wondered whether handbooks were written for girls who decided to become (maid) servants. I found Madam Johnson’s present: or, every young woman’s companion, in useful and universal knowledge. (Mary Johnson, 1769) on ECCO. I found this book particularly delightful as it not only contained examples of letters of recommendation, but also instructions on how to improve handwriting and grammar. 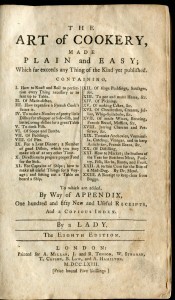 This handbook must have been very popular as between 1759 and 1769 four editions were published.